Genesis 29:4- 30:1-25Rachel and Leah were sisters, daughters of Laban and mothers of the twelve tribes of Israel, whose combined sons stand before them. A small compass in the background refers to their rule over ancient Israel. The mythical “lost” thirteenth tribe is represented by three tents behind Rachel and Leah. 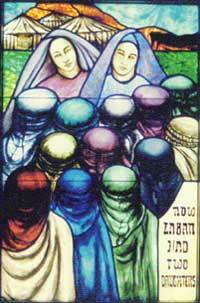 Leah, who stands to the right, is portrayed with half-closed eyes, as she is described in the Bible as “having weak eyes from crying.” Rachel is shown with wider eyes.